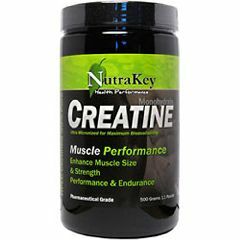 AllegroMedical.com presents The Nutrakey Creatine Monohydrate 500 Grams. Nutrakey focuses on delivering pure, high quality products & ingredients. The Nutrakey line of supplements is formulated with pharmaceutical grade powders and all organic naturals when applicable. We provide supplements that contain absolutely no fillers or additives. As a result, the Nutrakey products are not only extraordinarily effective but affordable as well. For first five days of use take 1 serving with water or your favorite beverage four to five times daily. Separate doses at least 2 hours apart. Maintenance Phase: Mix 1 scoop with water or your favorite beverage. Take 1 serving 30 minutes pre-workout & 1 serving immediately after training. Non Training Days: Take 1 scoop with first meal of the day, take second serving at least 6 hours later. Capsules: As a dietary supplement, take 2 capsules (1500 mg) with water or your favorite beverage, 2 times daily. 30 minutes before training, & immediately after.